Nearly three years ago, 86-year-old Douglas Waters developed severe vision problems. He was diagnosed with severe wet age-related macular degeneration (AMD), a chronic eye disease that causes blurred vision or a blind spot, in July 2015. 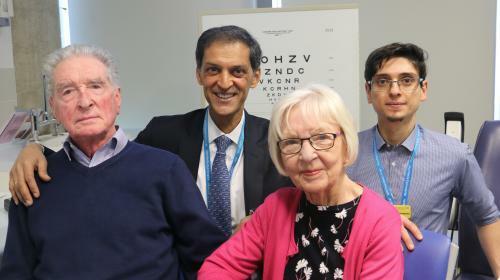 Three months later, he was one of two people to receive an experimental new treatment with stem cells as part of a clinical trial at Moorfields Eye Hospital in London. "In the months before the operation my sight was really poor and I couldn't see anything out of my right eye," Waters said in a statement. "I was struggling to see things clearly, even when up-close." After the surgery, which involved replacing diseased cells at the back of the eye with a stem cell based treatment, Waters said his eyesight improved dramatically and he can now read the newspaper and help his wife with gardening. "I feel so lucky to have been given my sight back," he said. Researchers say the study, published in the journal Nature Biotech, is a major milestone for the London Project to Cure Blindness, a partnership between Professor Pete Coffey from University College London and Professor Lyndon da Cruz, a retinal surgeon at Moorfields Eye Hospital NHS Foundation Trust. "We've restored vision where there was none," da Cruz told the BBC. "It's incredibly exciting. As you get older, parts of you stop working and for the first time we've been able to take a cell and make it into a specific part of the eye that's failing and put it back in the eye and get vision back." However, he is careful not to call this procedure a "cure," as completely normal vision was not restored. AMD is a common cause of vision loss around the world and can lead to rapid loss of eyesight. It occurs most often in older adults over the age of 65. The "wet" type of AMD occurs when abnormal blood vessels in the macula at the back of the eye leak blood or fluid, which leads to vision loss. "Dry" AMD, which involves the breakdown of cells in the macula, is more common and currently has no treatment. In addition to Waters, the doctors performed the procedure on a woman in her early 60's with wet AMD who was suffering from declining vision. During her operation, which lasted less than two hours, the researchers used a specially engineered surgical tool to insert a stem cell based patch under the retina in the affected eye of each patient. The patients were monitored for 12 months. They went from not being able to read at all even with glasses to reading 60 to 80 words per minute with normal reading glasses. While researchers say the study is promising, the treatment is still in early stages and not ready to make widely available. More research is needed to further determine the safety and effectiveness of the treatment, but they are hopeful they will be able to help more patients in the near future. "This study represents real progress in regenerative medicine and opens the door to new treatment options for people with age-related macular degeneration," Coffey said. "We hope this will lead to an affordable 'off-the-shelf' therapy that could be made available to NHS [U.K. National Health Service] patients within the next five years."